Why is this kind of failed activism acceptable? In the summer of 2009 the eyes of the world were on Iran, where citizens poured out into the streets of Tehran to protest a corrupt election. 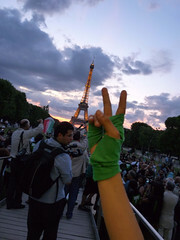 Solidarity rallies were held around the world, from Paris to London to Los Angeles to Melbourne. People showed solidarity on the web as well by changing their Twitter avatars or tinting them green, the color of Islam and of the protesters. In the end, neither solidarity action had much effect. The Iranian government brutally detained, tortured, and killed their own citizens. Out of fear, the people of Iran went back home andMahmud Ahmadinejad remained president. While few condemned the street protesters for their lack of effect, many branded the online solidarity action as “slacktivism.” Perhaps it was useful for raising awareness or showing the Iranian government that the world was watching, but it was still the absolute minimum that one could do. While both online and offline solidarity actions were ineffective, only the online one broadly was criticized. While both online and offline actions showed international solidarity and both failed to protect Iranian citizens, the failure of the offline rallies were morally acceptable while the failure of the digital action was not. Why? Here at the beginning of the digital age we are suffering from a functional gap between the scope of our compassion and the scope of our action. We know more about the rest of the world than we ever did before, both because we share an unprecedented global communication network (the World Wide Web) and because social media allwos us to self-broadcast across that network. We knew what was happening in Iran because Iranians were tweeting at us. We changed our icons because that was where our Iranian interlocutors were, where they could “see” us. It was less a political act than an emotional act, an act of empathy and compassion. But our political and civil society institutions have not evolved to match this increased capacity for awareness and compassion. Even though millions of people in the US (and around the world) decided that catching Joseph Kony was a goal that mattered to them, there was little that those people (or even resource-rich governments and international NGOs) could do to make it happen. We have a new compassion gap in that our compassion is greater than our capacity to act on that compassion. We perceive offline protest as legitimate – even when it fails – because it has been historically linked to effective outcomes. Digital activism is much newer, and its track record is more mixed, partly because of this gap between digital awareness and institutional response. Because of digital awareness we are failing at more ambitious and more global social change goals, but all skeptics see is the failure. But this can change. We are at the beginning of a new age of digital politics and I believe we will develop new methods of action to match the increased scope of our awareness and compassion.